The 22nd of February was ushered in by the ringing of bells, eloquent with tongues that sung of the glorious power of liberty and freedom. 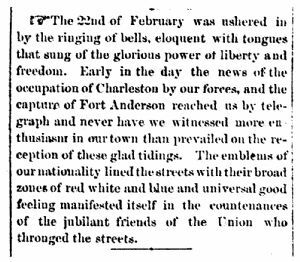 Early in the day the news of the occupation of Charleston by our forces, and the capture of Fort Anderson reached us by telegraph and never have we witnessed more enthusiasm in our town than prevailed on the reception of these glad tidings. The emblems of our nationality lined the streets with their broad zones of red white and blue and universal good feeling manifested itself in the countenances of the jubilant friends of the Union who thronged the streets.